Friends of mine are having a baby very soon. I wanted to make something special for them. 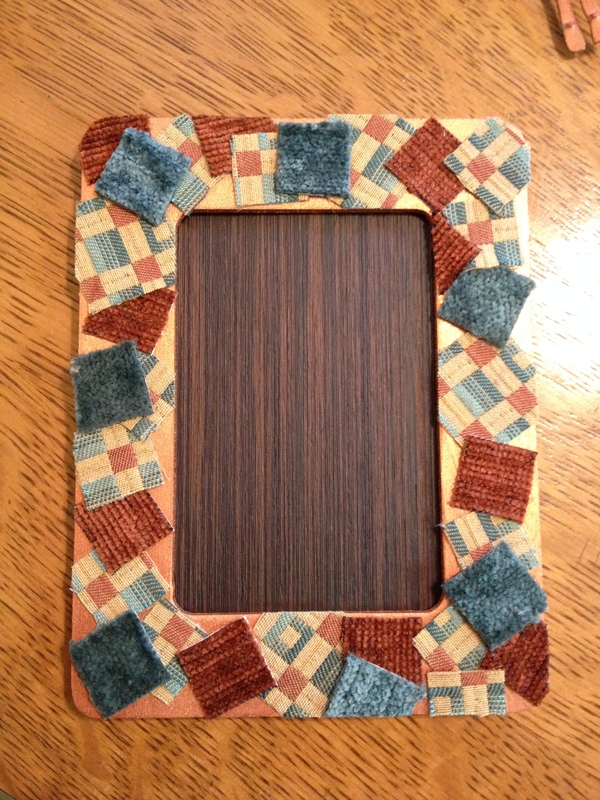 I looked through my arsenal of crafty supplies and decided to make some framed artwork. 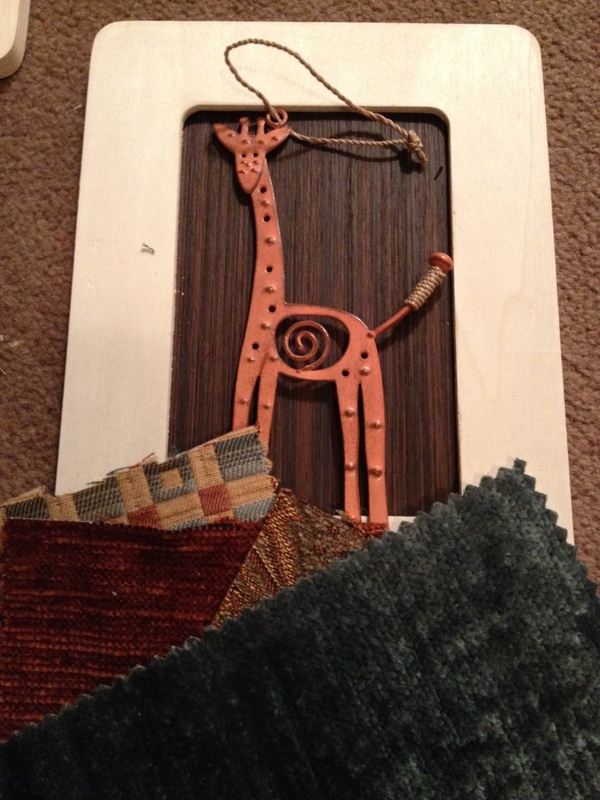 I had a metal giraffe and turtle that I wanted to integrate into the design. 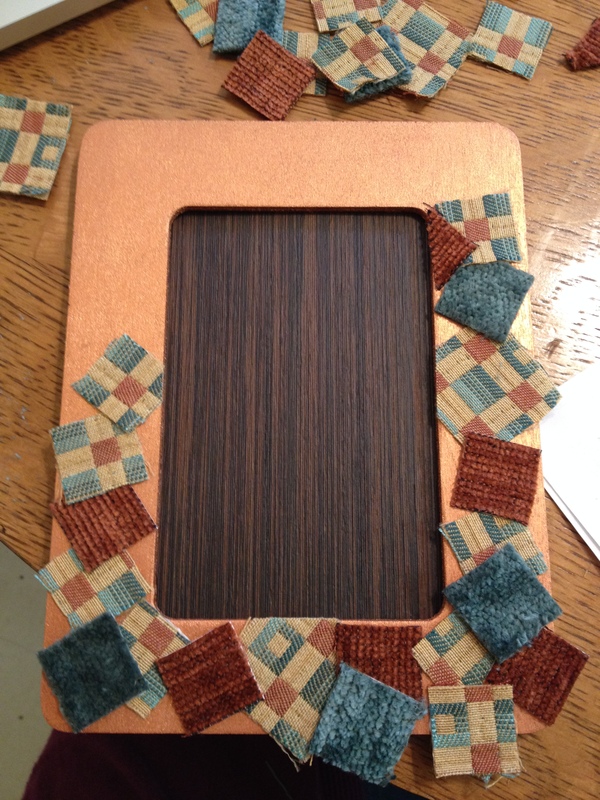 Using 2 frames, I selected some wood laminate scraps to use for the backdrop. 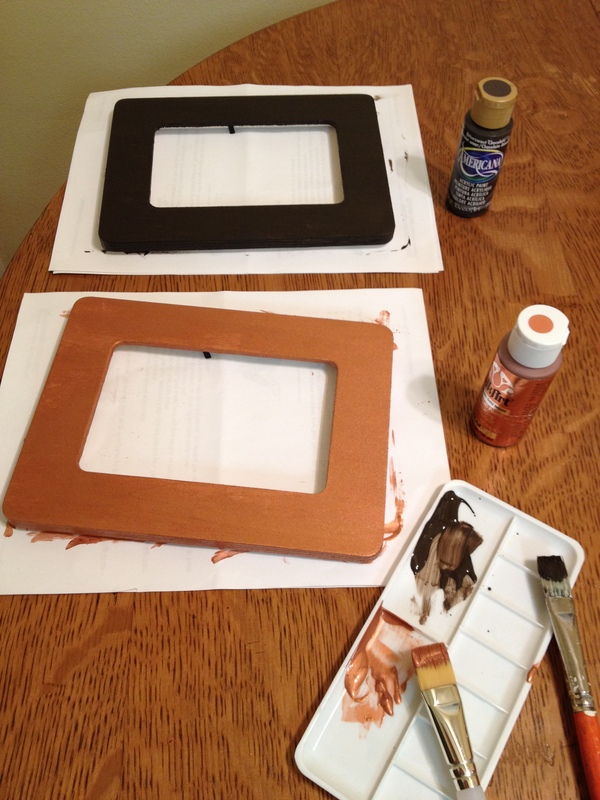 I painted the frames – the one for the giraffe got a coat of metallic copper and the turtle’s got a coat of dark espresso brown. 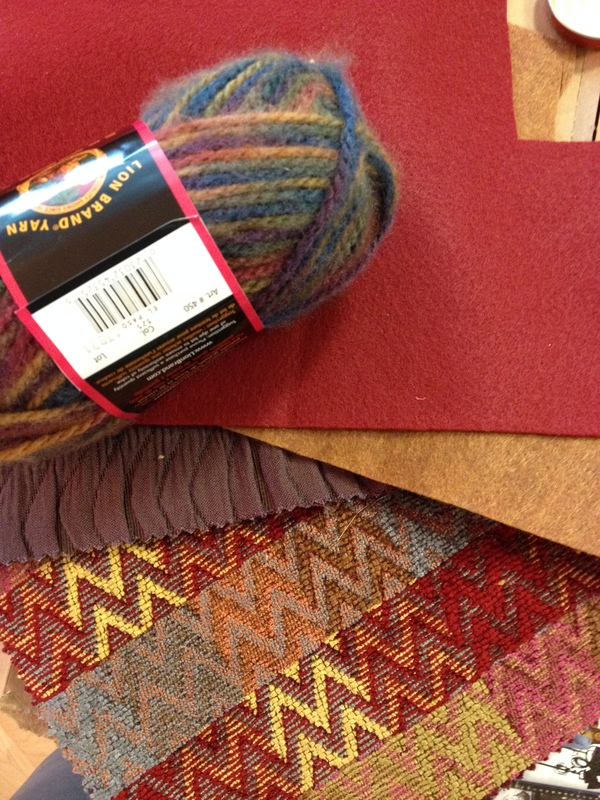 From there, I selected fabrics from my decorator sample books from SCRAP (still keeping me crafty!). 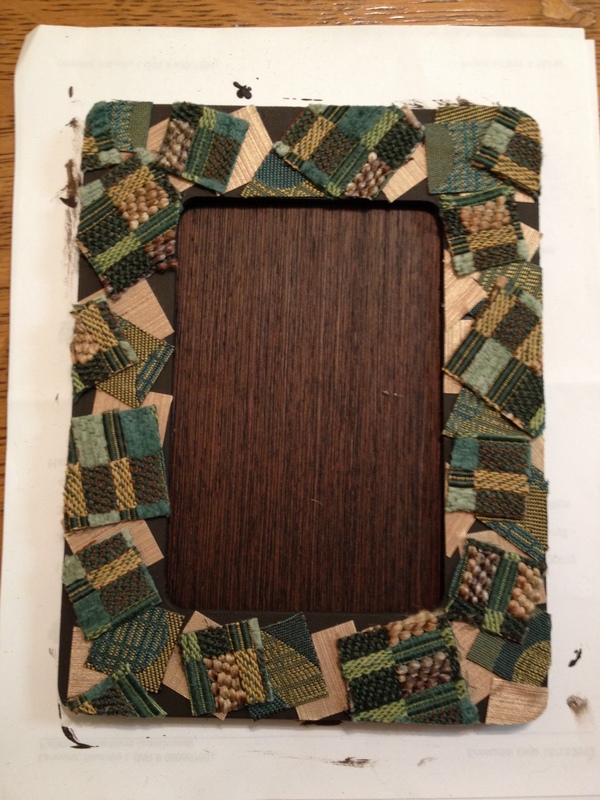 Cutting them into squares, I placed them around the frame and started gluing. 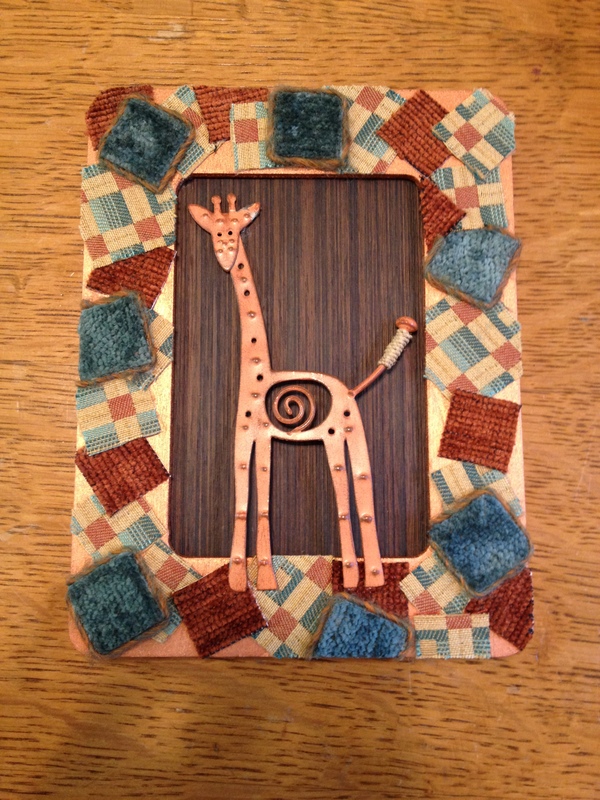 I added yarn around some of the pieces on the giraffe frame to accent the colors. After trimming all the excess edges around the frame, I glued the animals in place. I really like how they turned out. I only wish I had a few more animals so I could make some more! 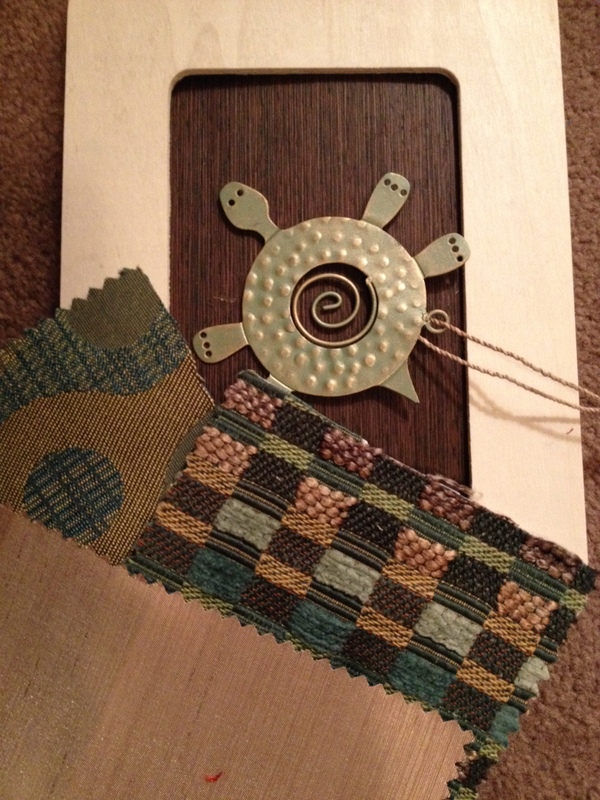 Posted in Craft Your World and tagged baby gift, Craft Your World, crafty, fabric, frames, reuse. Bookmark the permalink. 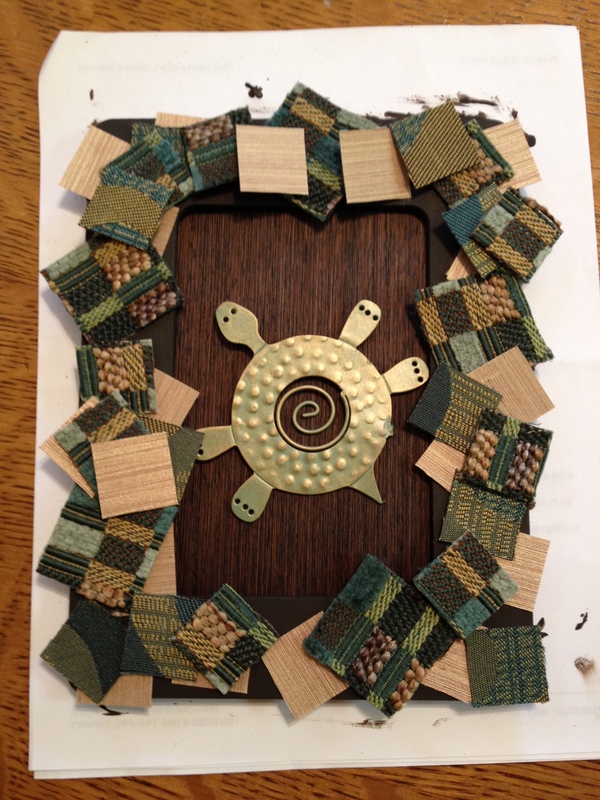 A friend of mine asked me if I would think about art projects that kids could do, but would look good enough that people would purchase them. Pinterest has a zillion ideas, so I started there. However, one night while trying to sleep, I had an idea about a frame that could potentially fit the bill and was cheap to make. I scribbled my idea in my notebook next to my bed and left it for a rainy day. Yesterday was that rainy day. I had a frame on hand from Michaels that has a heart cutout for the photo. It cost a whopping $1. 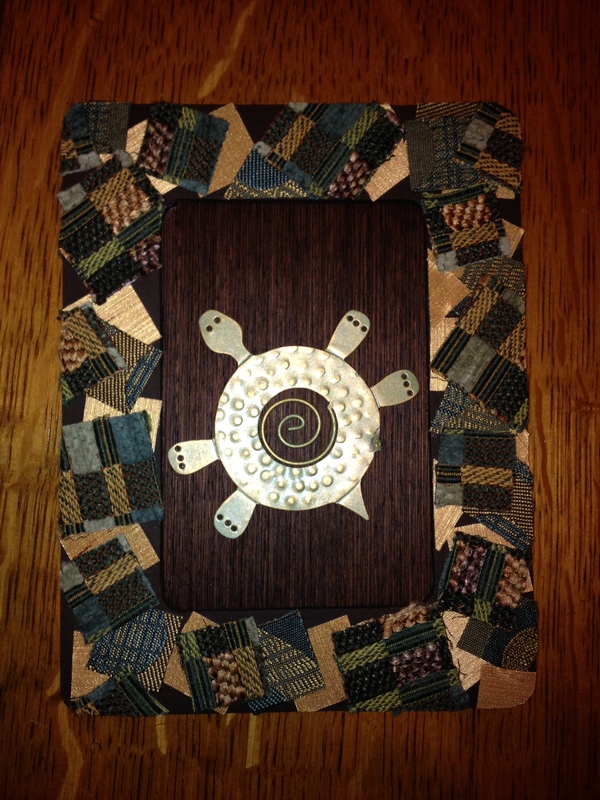 It started with a frame and an idea…. 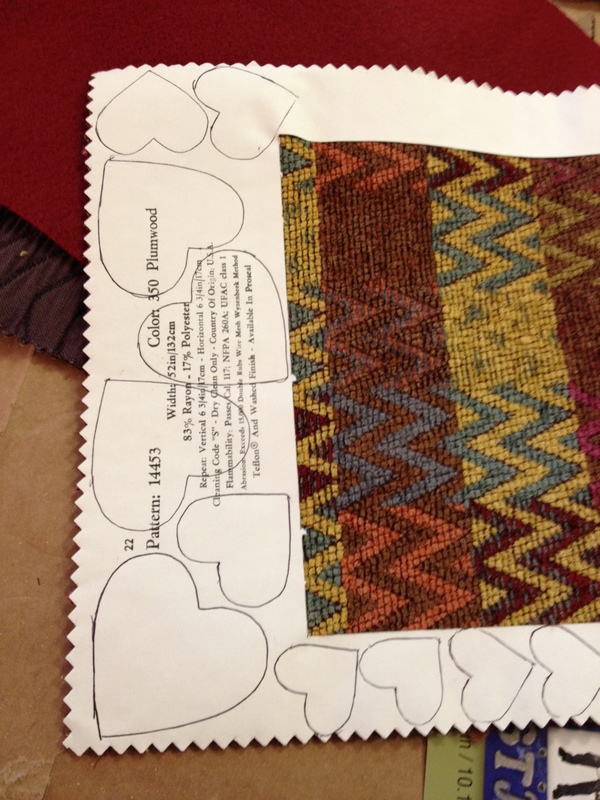 I searched through the decorator fabric samples I had on hand and decided on a pattern. 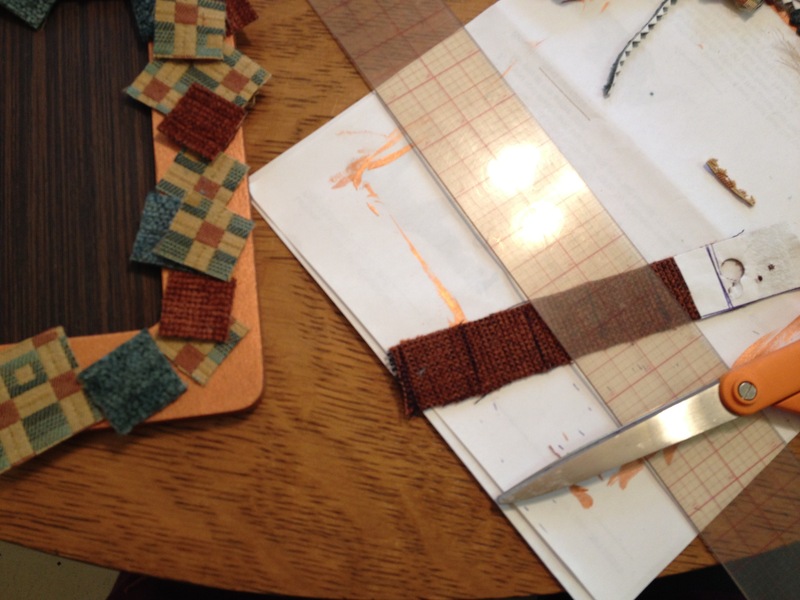 Then I accented it with felt and another solid, textured fabric and some variegated yarn. 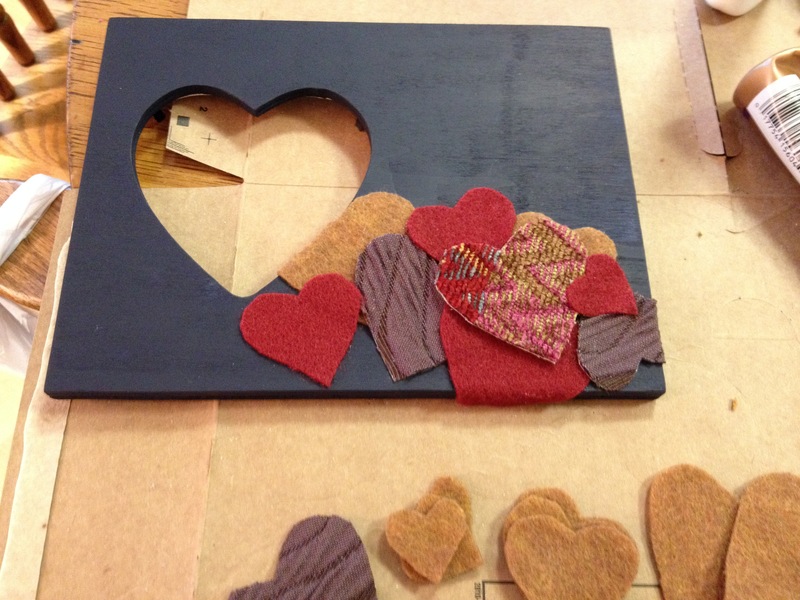 I created 3 different sizes of hearts to use as a template and began cutting them out of the materials. 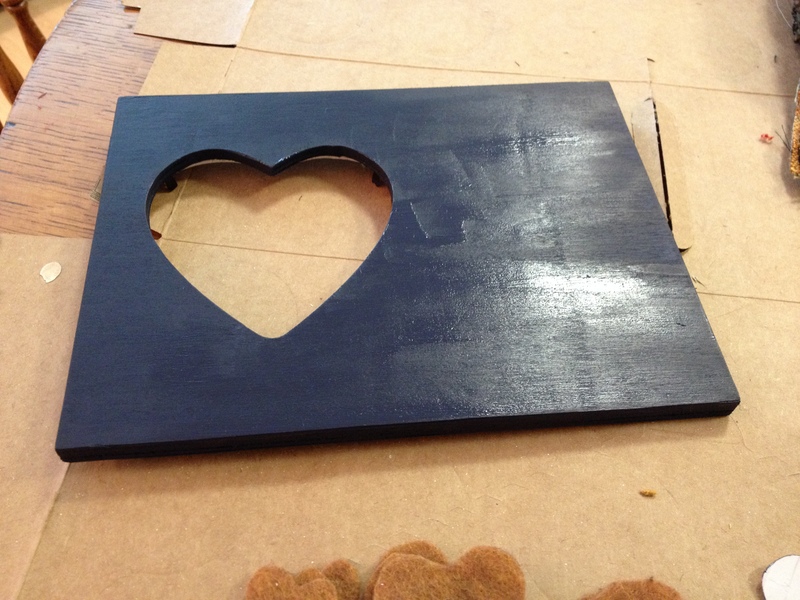 In order to avoid any wood show-through on the finished product, I painted the frame a dark blue. 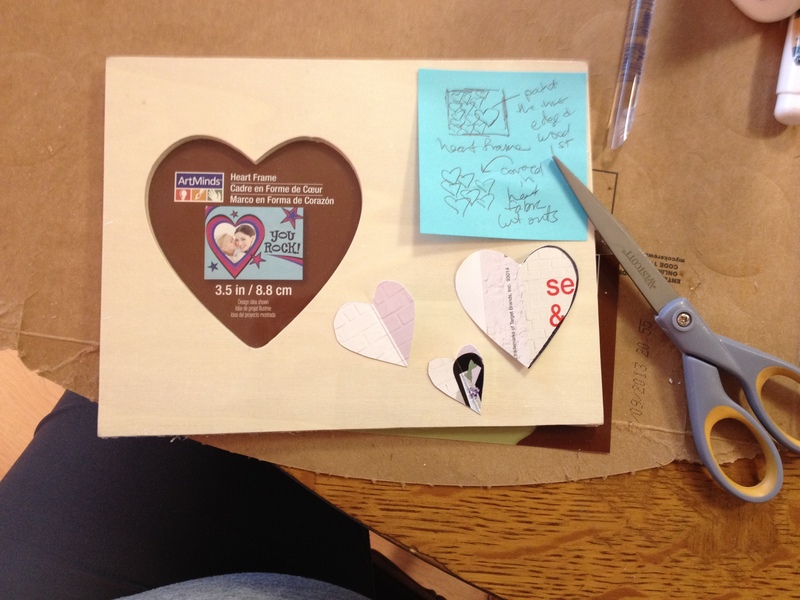 After it was dry, I used Tacky Glue and began placing the hearts on the frame – placing them in all different directions and overlapping. To accent the patterned hearts, I “traced” them in yarn. This makes them pop against the other colors. 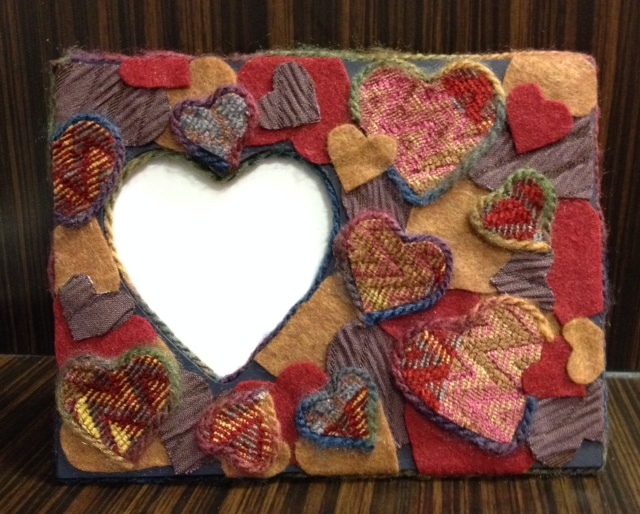 I used the yarn to finish off the interior of the heart and outline the outer edge of the frame. I think it looks a lot more expensive than its humble beginnings. 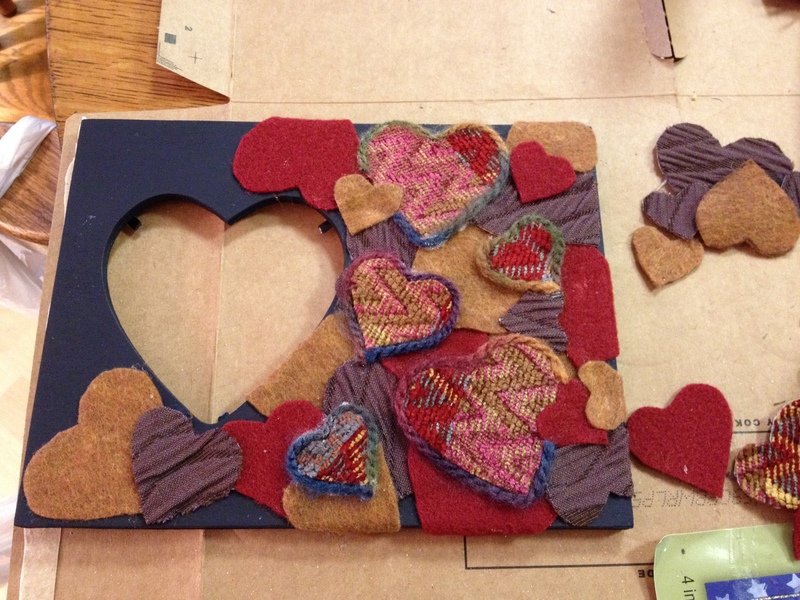 Posted in Craft Your World and tagged color, crafty, fabric, frames, hearts, reuse. Bookmark the permalink.